Plan and execute your next big art project with the art table with handy tote trays that keeps everything available at hand, and is made to last. 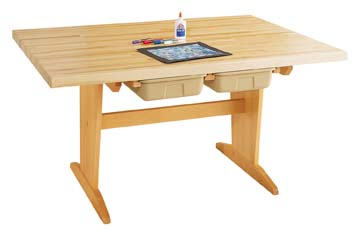 The DIVERSIFIED WOODCRAFTS Art/Planning Table w/tote trays (Quick Ship) offers a sturdy and broad surface for large projects ranging from painting to full scale models. This is a quality piece with two solid maple pedestal panel legs and two supporting maple truss bars with mortise and tenon joint construction. This table is made to last through many projects with draw bolt reinforcement, sealer finishing, and several coats of lacquer to make sure that the piece endures years of art projects. Styles include plain, book compartment with measurements of "15 x 15" x 2.5", or tote tray with measurements of 13" x 19". The whole unit is 60" W x 42" D X 30" H. Oversize Shipping is $151.45.